To end the academic year in a meaning way, the Sunday Dhamma School organised a Gratitude Day on 26 October 2014. The purpose of this event is to encourage students to express their gratitude toward elders such as Sayadaw, teachers, parents as well as kitchen helper. We started off the event by paying Puja to the Buddha, followed by chanting led by our Dhamma and mediation teacher Sayadaw U Pannananda. Thereafter our teacher, Sister Malini led the parents, teachers and students to pay our gratitude to Sayadaw for his Dhamma teaching and guidance. We also ask Sayadaw for forgiveness for wrongful bodily, verbal and mental actions that we did intentionally or unintentionally. Then everyone offered a robe to Sayadaw to show our appreciation to him before taking group photo. "I tell you, monks, there are two people who are not easy to repay. Which two? Your mother & father. Even if you were to carry your mother on one shoulder & your father on the other shoulder for 100 years, and were to look after them by anointing, massaging, bathing, & rubbing their limbs, and they were to defecate & urinate right there (on your shoulders), you would not in that way pay or repay your parents." AN 2.32 shows that the only true way to repay your parents is to strengthen them in four qualities: Establish your parent in conviction towards Buddha, Dhamma Sangha; establish them in virtue, in generosity and in discernment. To this extent one pays & repays one's mother & father. are called Brahma, first teachers, those worthy of gifts from their children. with food & drink, clothing & bedding, anointing & bathing, washing their feet. the wise are praised right here and after death rejoice in heaven. 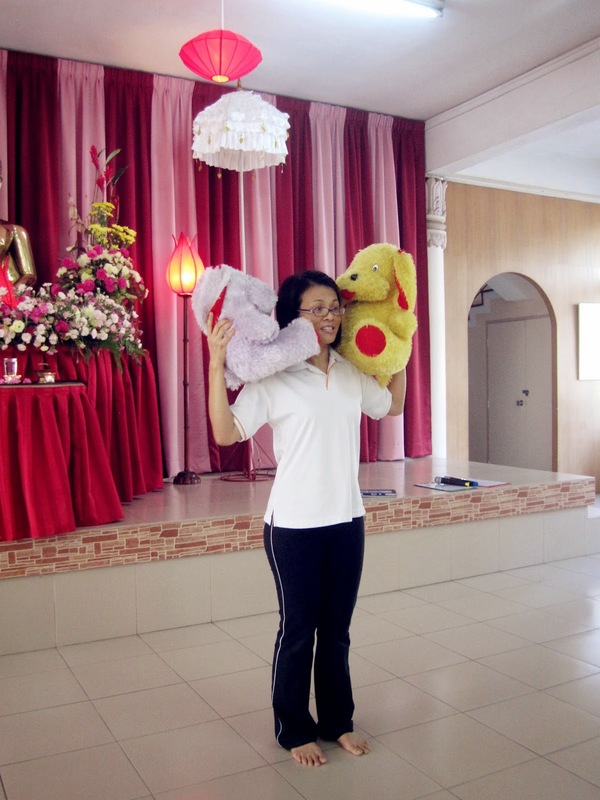 After the lively explanation of these two Suttas by Sister Malini, she invited the parents and students to take part in a game called "How much do you know your father and mother?" 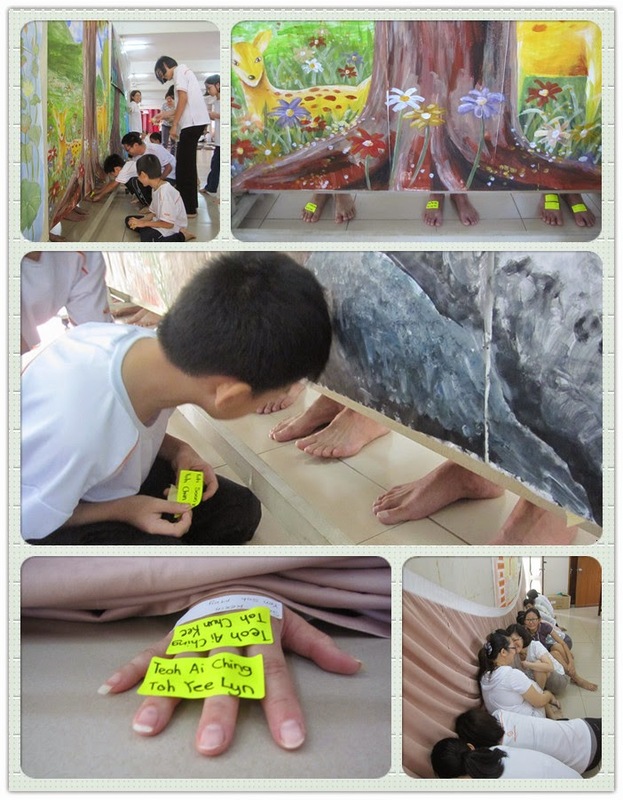 Firstly she asked the students to identify his/her father feet, then followed by identifying the mothers' hands. The purpose of this game was to give student the opportunity to get intimate with their parents and show their loves and appreciation for the contributions made by their fathers and mothers. Hopefully the students will have endless love for their fathers and mothers. Finally the most touching moment had come - the time to ask for forgiveness! The students offered drink to their parents and paid respect by touching their feet. At last. 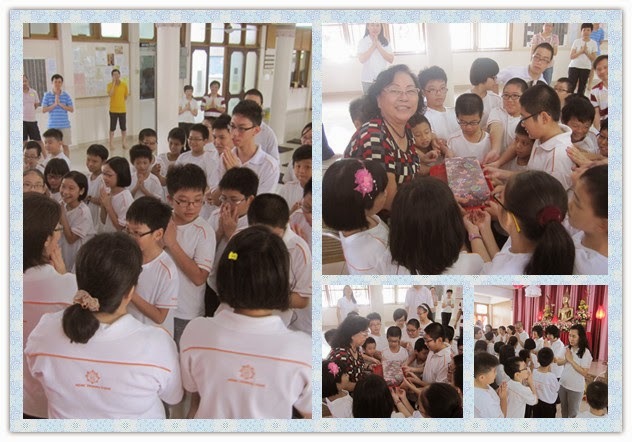 the students showed their appreciation to Auntie Annie and all the teachers of the Sunday Dhamma School and ask for forgiveness from them too. We wish all present have enjoyed very much and we wish every one has a Happy Family! The Sunday Dhamma School wishes our students continue to practice Sila, Samadhi and Panna in the holiday and see every one (together with your family members, relatives, neighbors, classmates and friends) of back in 18 Jan 2015!!! Sadhu! Sadhu! Sadhu! The Sunday Dhamma School wishes our students continue to practice Sila, Samadhi and Panna in the school holiday and hope to see every one (together with your family members, relatives, neighbors, classmates and friends) of back in 18 Jan 2015! !